Do you know how you can make a great first impression from the moment your manager assigns you to lead your first project? You can do this by asking the 6 Project Discovery Questions at the same time that your manager assigns you to lead the project. 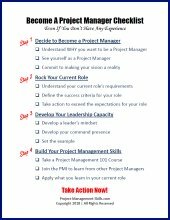 And just by asking these questions you will demonstrate to your manager that you are ready to lead this project. Project Discovery is the act of gathering key project information so you can gain a high-level understanding of your project. This is done by getting the answers to 6 questions. Together, these 3 constraints are known as the triple constraint. Question #1: What is the desired outcome of your project? This question is asked in order to determine what the main product, service, or result your project is tasked to produce. Question #2: What time-frame does your project need to be completed in? Schedule is one of the key constraints that will place a limitation on your project. Your management will have some expectation regarding how long your project should take to complete. The schedule they have in mind may be realistic or it may be impossible. Either way, it gives you a starting point for defining your project and understanding management expectations. Depending on the project, you may have a strict time-frame that the project needs to be completed in or you may have some schedule flexibility. For example, if your project outcome is to develop a prototype unit to be demonstrated at a trade show, you will have a strict time-frame for completing your project. The prototype must be ready to demonstrate by the trade show date. The third aspect this question provides insight on is project urgency. Urgency is determined by how quickly your project needs to be completed. If your project is urgent, it will need to be completed quickly and you will likely have a strict schedule. Question #3: What is the Budget for Your Project? Budget is another key constraint for most projects. The purpose of this question is to understand the cost constraints for your project. For example, if your project is delivering a service to an external client, the service would have been sold to the client for a specific amount. This is the revenue your company will receive for the service. For your project to be profitable, you will need to deliver the service for less than the revenue received. Additionally, your company may have a profit guideline indicating that services should be delivered with a specific profit margin. Continuing the example, if the revenue for the service is $100,000 and the target profit margin within your company is 30%, then the target cost budget for your project will be $70,000. Technically, your project cost budget is the approved cost estimate for your project. But at this stage, the detailed planning to determine the budget hasn't been done yet. So at this point in the project, your goal is just to understand what the key cost constraints are for your project. During the Project Planning phase you will create a detailed budget and cost estimate. Question #4: Who is the Project Sponsor? The Project Sponsor is the person or group that provides executive level support and resources for your project. They have the ability to influence the project to a major extent, making them one of your key project stakeholders. The Project Sponsor promotes the project and serves as the project spokesperson to higher levels of management. They will also be an escalation point for you if you run into issues that are beyond your control. This is a critical role to ensure the project has the needed support throughout the organization. You will want to build a strong relationship with your sponsor. As a new Project Manager, pay attention to who your sponsor interacts with and how they are able to keep your project moving forward. You can learn a lot from them. You may even look into having your sponsor formally mentor you. Question #5: Who is the Project Customer? The Project Customer is the person or group that is paying for the outcome of your project. They can be part of your organization or may be outside your organization. Since the Project Customer is the one paying for the outcome of your project, they will be actively involved in defining what the outcome should look like during the Project Initiation phase and in approving the final outcome the project produces. Question #6: Who are the End-Users of Your Project's Outcome? The last question you need to answer is, who are the End-Users of your project's outcome? Your End-Users may be the same as the Project Customer, but for some projects there is a clear distinction. For example, if your project is tasked with developing an online ordering system for the owner of a local restaurant, the Project Customer would be the restaurant owner since the owner is paying for the system. But the primary End-Users would be the people placing orders via the ordering system. In this example, the Project Customer and the End-Users would have different needs and requirements. There will be some overlap, but there will also be some conflicting needs as well. Remember, the purpose of the 6 Project Discovery questions is to get a high-level understanding of your project. During the Project Initiation phase you will formally define your project. During that phase you will create a Project Charter which will document why the project is needed, who the key stakeholders are, success criteria for the project, and the initial risks facing the project. Pro Tip: Write the 6 Project Discovery Questions on the inside cover of your notebook so you're ready when you're called to lead your first project. By asking your manager the 6 Project Discovery Questions when he assigns you to lead your project, you will make a great first impression. You will show your manager that you are able to hit the ground running and are ready for the challenge. Learn how the Project Discovery process will help you quickly get a high-level understanding of your project.